Root Canal Treatment is a procedure performed to treat an infected Root Canal which leads to tooth pain, this can be lifesaver for many patients who suffer from pain. But like all treatments, there will be failures and Root canal treatment failures are no different. The success rate of Root Canals is usually between 85-95% of all the Root Canals performed but the failure rate increases and changes from patient to patient and dentist to dentist depending on many factors. There are many patients who are skeptical about the success of a Root Canal Treatment as many of their friends and relatives have had a bitter experience with it and have faced failed RCT’s which would have lead to either Re RCT or Extraction of the said tooth. The major reason for Root canal infection to start with is the presence of Bacteria in the Pulp chamber or beyond the apex. This is also the reason for failure in most cases, there can be multiple reasons for the bacteria to be present in a tooth treated with Root Canal procedure and these are the reasons listed below which are the causes for a Root Canal Treatment to Fail. 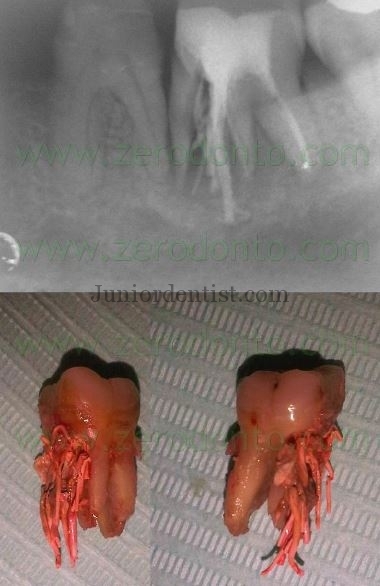 Untreated or Missed Root canals. Remaining or leftover Infected pulp tissue. Untreated or Missed Root Canal: This is one of the most common reasons for a failed Root canal procedure in Molars as there are multiple Roots and Pulp chambers and these are the teeth which are most common to have an extra canal or additional canal. According to a study, the presence of an additional canal is reported close to 75% of the time in the Upper First Molar. In some patients, there will not be any symptoms for prolonged periods of time and in some cases, there will be an instant pain, the earlier is the cause for Failed Root Canal treatment as the dentist who might have missed the canal feels that the lack of pain means there is no additional canal. Using of modern equipment such as Microscope, CBCT (3-dimensional imaging) helps in identifying any additional Root canals which are usually smaller in size as compared to the regular Canal openings. Remaining or Left Over Pulp Tissue: This is another major reason for failure of Root canal Treatment, in some instances the Root canal is curved or bent at angles which make it difficult to reach, some canals are extra long – Normal Root canals range from 15mm to 25mm in length but some canals can reach up to 30 mm which makes it quite difficult to reach as these need specialized equipment to treat. So basically If a canal is treated short of its total length, there will be left of infected tissue in the canal which can lead to Failure in the Root canal in future. Following proper Irrigation protocol can help in avoiding this problem, along with having the right equipment such as Glide Path files (thinnest and most flexible) help in reaching the apex of the root canal and gives a path for the other subsequent files to follow. This prevents any remnants of pulp tissue from being left in the root canal. The third point – Incompletely Treated Root Canals includes Left over infected pulkp along with other complications like short treatment due to ledges, complex anatomy, lack of experience, or lack of attention to quality. Coronal Leakage: This results from leaking crown or Restoration, when the crown or the Post RCT Restoration is not properly done it results in leakage of contents of the oral cavity into the pulp chambers and thus re-infecting the Root canal System. 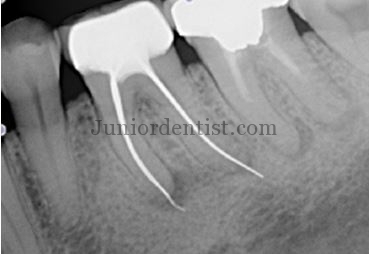 This leads to failure of the Root Canal Treatment done thus requiring a Re-RCT along with a new Restoration or Crown as well. Fracture of the Crown or the Tooth itself can be a reason for Coronal leakage as well. Over Extension of GP point into peri apical region: This can be termed as an Iatrogenic cause for Failure of RCT where the Dentist is question is at fault. This happens when the GP point is over extended or crosses the tooth apex and enters the Peri Apical region thus inflamming the surrounding tissue. Breakage of File in the Root canal: This is an unfortunate but a known cause of failure of Root canal treatment where the Files used to perform Root canal treatment is broken in the canal and gets lodged. This is most commonly seen in Teeth with severly curved canals which lead to breakage of the instrument due to excessive torsion force being applied. In most cases if the instrument is removed and Re-RCT performed or the file is bypassed which can be done by an Endodontist with a Microscope the tooth can be saved from future infection. Periodontal or Gum Infection – Perio-Endo Lesion: In some rare cases it is seen that a Periodontal or Gingival infection like Periodontitis or Gingivitis can lead to Infection of the Root canal which is termed as Perio-Endo Lesion. Root canal treatment is a very complex kind of dental treatment. Sometimes, failure can occur. I really like this post and information you have provided here. It helped the readers to learn a lot from the procedure and risks involved. Thanks. I would like to see more good posts regarding the need of good dentists and cosmetic dentistry.